Sunnylands in Rancho Mirage was the winter home of former US Ambassadors, entrepreneurs and philanthropists Walter and Lenore Annenberg. Designed by iconic Southern California architect A. Quincy Jones, the 22,500 square foot Mid Century Modern home, completed in 1966, served as an unofficial center for world leaders, US presidents, politicians and celebrities, who were frequent guests of the Annenbergs for more than 40 years. Situated in the middle of 200 acres of landscaped grounds and a private golf course, all surrounded by pink block walls, anticipation of seeing the magnificent Aztec-inspired glass and stone estate builds as you drive up the winding road to the summit. There, an artistic fountain centers a circular drive up to the home’s entrance. Imagine the limousines and Rolls Royces pulled up for the likes of Queen Elizabeth, Prince Phillip, the shah of Iran’s mother and sister, Japan’s prime minister, and every US President since Richard Nixon. 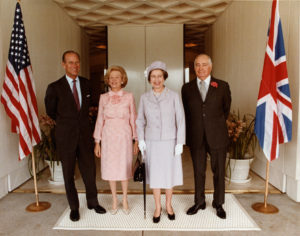 State dinners, international conferences, national policies, state of the union addresses, and record-setting national gifts were some of the major events that took place at Sunnylands. Its acclaimed guests provided Rancho Mirage the famous moniker: Playground of Presidents. Although constructed of rugged steel beams (painted green), concrete, stone and glass, the magnificent home seems to float — both floor and ceiling — across water and space. The central atrium is filled with pink bromeliads – Mrs. Annenberg’s favorite color — and Auguste Rodin’s bronze sculpture of Eve under a raised roof that allows natural lighting to flood the room. Natural lava stone walls and marble floors give both rugged and polished texture to the interior. The sensation is that the sky and ground are supported by soaring walls and strategic columns, while exterior glass walls showcase acres of rolling lawns and the towering San Jacinto and Santa Rosa Mountains. On a docent led tour of the estate, visit the Annenberg’s private office filled on one side with photos of his famed visitors and the other with rare family photos. Original 1970s furnishings in Mrs. Annenberg’s bedroom preserve the sense of time and place. Bright yellow bedspreads, her white writing desk with yellow cushioned chair, and yellow carpeting speak of a light and cheerful spirit. Interiors designers William Haines and Ted Graber created seating and tables lower to the ground to give guests a more casual, relaxed feeling. The historic estate is comprised of two guest wings and three guest cottages for a total of 22 bedrooms that are now available for retreat accommodations. All rooms offer magnificent views of the grounds with 11 man-made lakes, over 6,000 trees, the nine-hole golf course, a 30-foot Kwakuiti totem pole, tennis court, and numerous art sculptures. Sunnylands is a visual translation of Mid Century Modern ideals and aspirations — particularly the California desert — that connects the formal with the informal, indoor spaces with the greater outdoors, imparting a sense of freedom and possibility. Committed to the ideals of public service, the Annenbergs placed their estate in public trust. 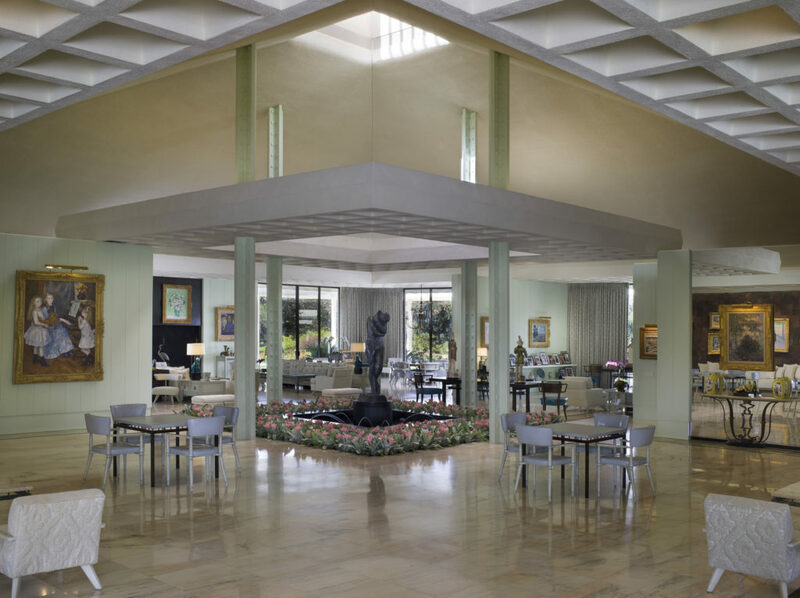 The Annenberg Foundation Trust at Sunnylands oversees the estate and the Sunnylands Center and Garden. The home now welcomes the public on guided tours and continues to provide a West Coast center where US Presidents, government officials, and world leaders can participate in high-level retreats on national and international issues. The nine-acre Center & Gardens features information, walks, an historic estate tour, and programs on the Annenbergs role in American history, the architecture of the historic house and their incredible modern art collection. Films, exhibitions and interactive media stations detail the events of the times and the Annenberg’s role in them. The Gardens are home to a variety of arid landscape plants and wildlife. Guided tours of the estate are $48 per person and reservations can be made online at www.sunnylands.org. 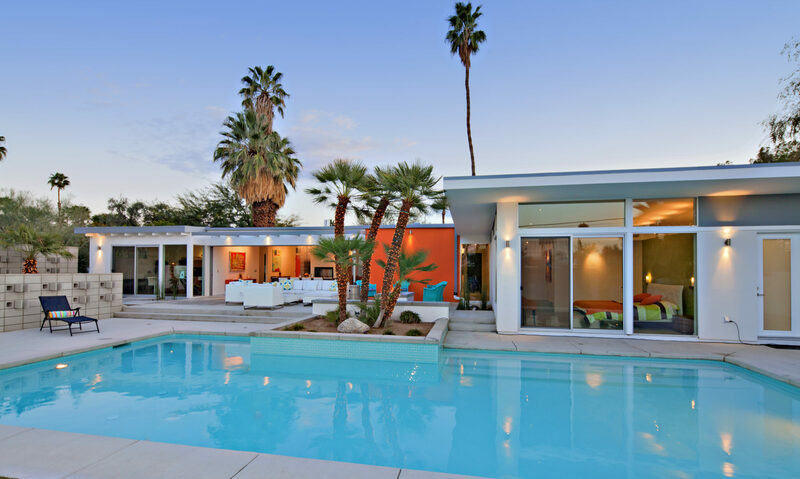 After you have taken a docent-led tour of Sunnylands, visited the Center & Gardens, you might re- envision how life could be lived and are ready for your own Mid Century Modern home or estate.